While Moscow hasn’t given up its public backing of Maduro, it increasingly recognizes that the disastrous state of Venezuela’s economy is inexorably draining what remains of his public support, said two people close to the Kremlin. At the same time, the army’s reluctance to crack down on its own citizens limits his ability to use force to crush the challenge to his rule, said the people, who asked not to be identified because the issue is sensitive. Moscow remains wary of Maduro’s U.S.-backed opponents but is acutely aware how few levers it has to rescue a client who’s too deep in financial distress for the Kremlin to bail him out and too far away for Russia to deploy significant military force to shore him up. For years, Russia along with China has been a major backer of Maduro, with ties dating back to 1999 when his predecessor Hugo Chavez came to power. It extended billions of dollars in loans and investments, most by state-owned oil giant Rosneft PJSC, and is scrambling to protect its interests as U.S. President Donald Trump steps up efforts to oust the Venezuelan leader, crippling the country’s economy with sanctions. Despite the history of support, Moscow has ruled out providing new money to an ally that’s had to have past debts restructured. 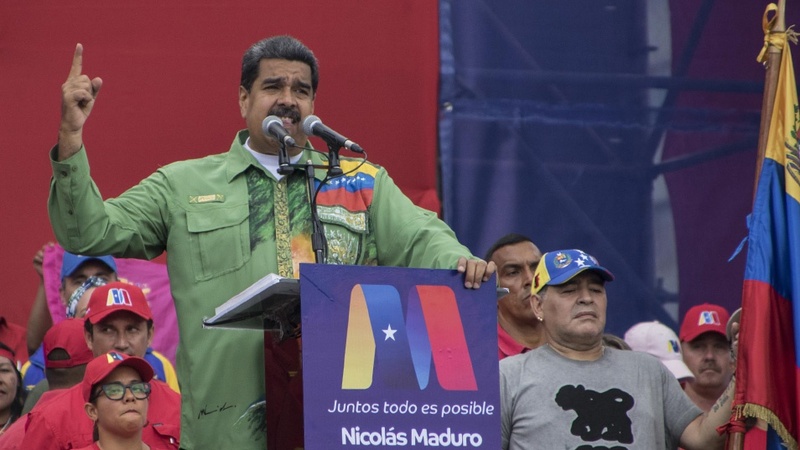 The latest warning sign for the Kremlin was the recognition by key European powers of National Assembly leader Juan Guaido as president after Maduro refused to call new elections. 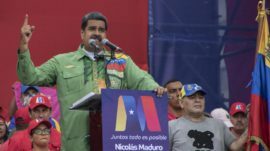 This followed the defection of an air force general and Maduro’s failed bid to ship 20 tons of gold out of the Latin American nation to raise much-needed cash. Though lesser officials have backed the Venezuelan leader, Russian President Vladimir Putin has made no public statement in support of Maduro since the crisis erupted beyond a phone call to him on Jan. 24. Venezuela is of limited strategic importance to Russia, though it offers symbolic significance in demonstrating Putin’s reach into a region seen as Washington’s backyard. Russia doesn’t have the capacity to send forces there as it did to support Syrian leader Bashar Assad, limiting itself to publicity stunts like a December visit by two nuclear-capable bombers. Talks between the Venezuelan government and opposition are the only way out of the crisis “otherwise, there’ll simply be the sort of regime change that the West has engaged in many times,” Russian Foreign Minister Sergei Lavrov said in Tajikistan on Tuesday. While Russian officials have publicly ruled out talks with the opposition, contacts are likely taking place behind the scenes, according to analysts in Moscow. Guaido reached out to China with a pledge to uphold agreements signed under laws approved by the National Assembly, whose powers Maduro stripped in 2017, in an interview with Bloomberg News. A democratic Venezuela would be a better bet for protecting Russian and Chinese investments, he said last week. The opposition-controlled National Assembly has criticized the growing role of Rosneft, headed by a powerful Putin ally, Igor Sechin, which has stakes in five Venezuelan oil ventures. 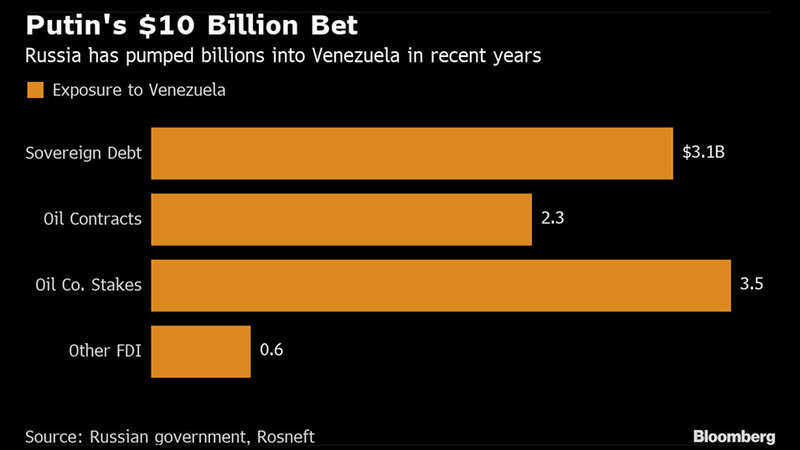 The company said Tuesday that Venezuela’s state oil producer, PDVSA, paid off half of its outstanding debt to Rosneft last year, owing $2.3 billion at the end of 2018. Rosneft took a 49.9 percent stake in PDVSA’s U.S.-based subsidiary, Citgo Petroleum, as collateral for a $1.5 billion loan in 2016, and signed a deal in 2017 to operate two offshore natural gas fields. While those deals could be canceled because they weren’t endorsed by lawmakers, Russia may negotiate a compromise, said Rozental. A Russian mission to Caracas confronted the scale of Venezuela’s economic collapse when it visited in November, before the political crisis erupted. The team, which moved around in armored cars, was shocked at the poverty of ordinary Venezuelans on the streets, according to one Russian official on the visit. With Venezuelan oil exports already at a 28-year low and due to slide further as U.S. sanctions banning PDVSA’s crude sales take effect, Russia knows the real culprit is mismanagement of the world’s largest proven reserves, said Andres Landabaso Angulo, a professor at Moscow’s Plekhanov University of Economics. The U.S. and its allies in the region and beyond are determined to oust Maduro, while Russia can’t risk a major confrontation in Washington’s backyard, said Ivan Konovalov, director of the Center for Strategic Trend Studies in Moscow. “At the end of the day, Guaido won’t be such a tragedy for Russia.” he said.